And more. We've covered a lot of information, so let's jump right in! Ashley: First of all, would you mind telling us a little about you and your clinic? 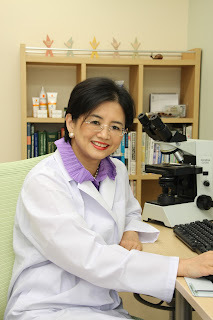 Dr. Keong: I am a board-certified dermatologist, studied and trained in Japan. 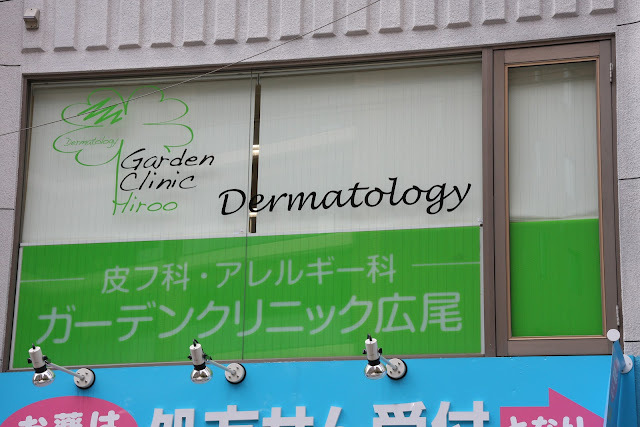 Garden Clinic Hiroo is essentially a dermatologist’s clinic specializing in adult and pediatric dermatology and cosmetic dermatology. In addition, we offer testing and advice for allergies related to the skin and the environment (like pollen allergies). We believe in preventive medicine, so we also offer services for childhood vaccinations and adult travel/college enrollment vaccinations. Due to the limited number of doctors in Japan familiar with foreigners and medical situations outside of Japan, we offer some services in documentation for travelers/students, etc. Ashley: What problems do expats living in Japan typically come see you about, and do you have any general advice regarding these issues? Dr. Keong: The majority of expats in Japan are under 50 -- mostly families and single working adults. Children come for problems like atopic eczema, impetigo, warts, food allergies and infectious skin diseases like chickenpox, measles, etc. For teenagers it’s mostly acne, but occasionally infections like athlete’s foot, warts, etc. Adults see us for a range of problems: from adult acne to athlete’s foot to herpes to chronic skin problems like eczema and psoriasis to age spots to skin cancers. Skin cancers tend to be more of an issue with the Caucasians and less of a problem among Asian or darker-skinned expats. My best advice: get seen as soon as possible by a specialist if your skin condition is not getting better with OTC medicine or if your physician has treated you but you are not seeing any improvement. Sometimes, your skin condition may have changed for the worse, or the diagnosis may have, even though you may have seen a doctor a while back and received treatment. Ashley: In your experience working at the International Clinic and with foreigners, how similar or different are dermatological issues treated in Japan versus other countries? Dr. Keong: As mentioned above, skin problems tend to differ from one nationality (race or skin color) to another. Caucasians tend to have more concerns with moles and skin cancers. Darker skinned individuals like Africans and curly-haired Caucasians tend to suffer from infections related to ingrown hairs (which is almost non-existent among Asians as they have mostly straight hair). We tend to see more cases of conditions like psoriasis and rosacea among Caucasians and less among Asians. Otherwise, across the board whether Japanese or foreigners, we see the same skin problems like bacterial or fungal infections, warts, acne, eczema, dermatitis, etc. With cosmetic issues, Asians, including Japanese, tend to be more concerned about skin pigmentation, whereas Caucasians tend to have problems like broken veins, redness of the skin and early skin wrinkling. Dermatological issues are generally treated with similar methods whether in Japan or elsewhere. There are certain guidelines (like those set by the American Academy of Dermatologist, Japanese Dermatological Association, etc.) that doctors follow, and we read the same books and literature updates. Reason (1): the Japanese health insurance system. The health insurance companies decide what services/tests/treatments they will pay and not pay and this applies across the board. Anything not paid for will generally NOT be implemented in Japan. Few doctors would care to bring say, Accutane, into Japan, because (i) the paperwork is a hassle, (ii) it is costly and Japanese patients tend not to want to pay from their own pockets for private treatment and (iii) doctor’s liability insurance will usually not cover us for any accidents or problems that may arise from treatment using medications not approved here. So, unfortunately, what incentive do doctors have to try anything new? Reason (2): Many new treatments will only be approved for use in Japan only after they has gone through the rigorous testing as required by the Ministry of Health. That means many medications already approved for use by the FDA will have to wait several years for them to be approved in Japan as clinical testing using Japanese as subjects usually takes a few years. Ashley: A common request among foreigners living in Japan is how to ask about something (e.g., cystic acne, moles, and various other skin conditions) at the doctor's office when they need something looked at or treated. What tips do you have or what should we know about or be aware of when we see a doctor/dermatologist so things don't get lost in translation (in English or Japanese), especially if they don't want surgery if it isn't necessary? Surgery usually requires quite a bit of preparation at my clinic and we usually need a 30 minute appointment and some pre-surgery tests before we venture any further. Of course, when it comes to surgery or any big procedure, it is probably best to visit an English-speaking doctor, or bring along someone who can translate for you. Or, if the issue is not an emergency, see your doctor at home the next time you visit. As a rule of thumb, I would say you need to feel comfortable with your doctor. Sometimes it is not just a language problem. The doctor may speak perfect English or your Japanese may be near perfect, but if you are not comfortable with each other (yes, I meant each other), then a procedure like surgery or even cosmetic treatments, such as Botox, should not go on. For dermatology, fortunately or unfortunately, most times, the patient is able to see the skin problem. He or she can often point out to the doctor/dermatologist what he or she is concerned about. Himawari is a good website to find doctors who speak a foreign language in your area, if you live in Tokyo, but again, it may not be absolutely accurate either. Editor’s note: You might also want to check out Japan Healthcare Info to help you find an English-speaking doctor in Japan. Ashley: Briefly, what are the latest treatments available in Japan for adult, hormonal acne? Also, is Accutane legal in Japan? Dr. Keong: Adalpalene (Differin gel) has been on the market for about four or five years now and is considered a very effective treatment for acne. It is available via prescription under insurance. Oral Accutane and its equivalent are not approved for use in Japan and therefore not available for prescription; although it is extremely useful for patients with nodular or cystic acne. I have occasionally helped monitor patients who want to be on Accutane. This can happen if the patient has a dermatologist in his/her home country willing to prescribe the medication and mail it to the patient. We will not import the medicine on behalf of the patient simply because of the paperwork nightmare. These services are offered on a private basis under special arrangements and will not be covered by Japanese health insurance. Adult acne is another major problem. While teenage acne usually respond well to treatment with oral antibiotics and adalpalene cream, it is much more difficult to treat adult acne as it is hormonal-related. We may occasionally offer to treat the patient with herbal medications, oral contraceptives, Azelaic acid creams, or Retin-A creams but the latter creams are not covered by insurance in Japan. Some patients may benefit from treatments with lasers, IPL or chemical peeling and ionotophoresis. Some doctors may offer LED lamp treatment. A number of the “latest” treatments are available, but the majority of non-standard treatments are not covered by insurance. Since almost 100% of the Japanese population comes under that Japanese insurance, you will not find many doctors outside the major cities offering such services as the demand is probably less. Ashley: Do you have any tips for those living in Japan with eczema or extremely dry, itchy skin? How are these usually treated in Japan? Are there any over-the-counter products that can help? Dr. Keong: Atopic eczema is a skin condition related to other medical conditions in the atopy family (i.e. asthma, allergic rhinitis like hay fever, and atopic eczema). Most people who do not have an atopic history will likely have just dry skin. For such individuals, OTC moisturizing creams like Curel, Atopico, Nivea or plain old petrolatum jelly (Vaseline) will usually do the trick. However, people tend to be “lazy” and do not apply it frequently. I would say if you have dry skin, consider applying the moisturizer twice daily and make it a daily ritual. People (especially children) who have atopic eczema have a more serious problem and I recommend that if your skin condition has not improved after you have diligently applied a good moisturizer, then it is time to see a dermatologist. The earlier the condition is brought under control, the better. You may not be able to cure the condition, but you want to manage it well. Again, your doctor may be able to prescribe the appropriate steroid cream and antihistamines for your needs. For atopic eczema, steroids and tacrolimus creams (protopic) are used, usually combined with one or two oral histamines. Doctors would taper the dose or reduce the potency of steroids once the skin condition improves. Generally, I think treatment of atopic eczema in Japan does not differ very much from that of other countries. The use of topical moisturizers is encouraged. I usually show my patients HOW they should apply the creams prescribed to them. It is interesting to note that patients may have actually been using the exact same creams with little improvement but would show tremendous improvement once they learned how to properly apply the cream. There are prescription moisturizers, but petrolatum jelly works well too. Also, the winters in Japan can get very dry, so I would encourage families with children or even adults with dry skin and atopic eczema to invest in a good humidifier and also a hygrometer (a humidity gauge) to check on the humidity in the room is comfortable. Ashley: Your clinic also offers cosmetic dermatology services such as botox, chemical peels, and permanent hair removal, among others. In Japan, who/what type of professionals are legally able to provide these types of services? Dr. Keong: In Japan, only medical professionals are allowed to offer services in cosmetic dermatology. Some doctors may have a nurse perform these cosmetic procedures but they must always be under the supervision of the doctor. Occasionally one might find fliers from beauty salons offering face peels or permanent hair removal therapies. These salons are certainly NOT using the same equipments as they are not legally allowed to use any of the equipment that doctors use. The equipment used in beauty salons usually have a much weaker output. Ashley: For folks who don't live anywhere close to Tokyo (where your clinic is located), where might they go for cosmetic dermatology services? Beauty salons, dermatology clinics, hospitals, etc.? Is there a way to find reputable providers of these services in other parts of Japan? It’s best to check with friends who may have had a good experience. Otherwise check websites before walking in. Like I mentioned earlier, check out the clinic or hospital in person and if you are comfortable with the place and the doctor, then go ahead. For cosmetic procedures, this is what we do: I like to have a chat (basically a consultation) with my clients before starting any cosmetic treatments to make sure we are on the same chapter. We want to have similar expectations. I am also upfront in terms of costs and realistic expectations. We also have our clients sign a letter of consent before we do anything cosmetic. Occasionally I have to treat patients who come to me because they have received some sort of cosmetic treatment at some other clinic with unsatisfactory or alarming results. They usually tell me that it was some place where they never got to meet the doctor a second time and no one discussed with them the pros and cons of the cosmetic procedure before they went ahead with it. Even worse, the clinic/hospital had refused to treat them for the skin damage that resulted from the cosmetic procedure. My advice here is, if a patient walked into a clinic and did not get to have a satisfactory discussion with the doctor or nurse before they were guided into the treatment room, they should not go ahead with the treatment. If you live in a smaller city and do not have the advantage of choices like you do in Tokyo or Osaka, then my advice is to seek out the university hospitals and some of the larger medical institutions that might have a cosmetic dermatology sub-department under the arm of the dermatology department or the plastic surgery department. Many hospitals do not publicize them but they do have lasers and might do botox and fillers as well. Of course, all cosmetic procedures are not covered by health insurance. Ashley: Dr. Keong, thank you so much for your time and for generously answering our questions. We wish you and your clinic the very best.